The Compulsive Reader: Legend Movie News! 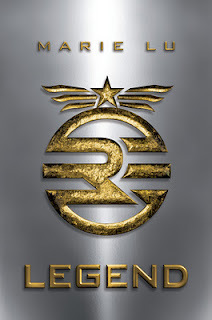 We've known for a little while now that Marie Lu's Legend was optioned for the big screen. While movie deals for YA books don't often result in actual movies, this article from MTV makes the possibility of a movie look very promising. I really like what the producer, Wyck Godfrey, said about the characters of Legend--that they seem older than 15. That was probably the main reason I had a little bit of a hard time truly loving Legend--those characters were very mature and had the skills of people who were 18 or 19, not 15! If they were aged by a few years in the movie, I wouldn't have a problem with it. Once again, here is the link to the article, and here is the link to my review. What did you think of Legend? How do you think it would play out on the big screen? I'd love to see these characters aged up a bit! Kind of like HBO's Game of Thrones. It would give more plausibility and more intensity to the action, for some reaosn. Gilly, I definitely agree! I just had a hard time believing that characters so young had so much authority, freedom, and control in this new government. And while I wouldn't want them to be any older than 25 or so, I think that it could be done well. I wouldn't want them aged too far, as part of the point was that they were prodigies. I completely agree about the age thing. I always pictured the characters older in my mind, not as young teens. Thanks for posting!